There are many times, too many to mention, where I wish I could sit with my father and ask him about his family, about the stories he heard growing up, and about the “whore” that made him stop in his research (there’s a note from an uncle that says my father told him so). But I can’t because he’s not here anymore. And I didn’t get the urge to research my family tree until after he’d passed, when I realized the delicate tether between myself and him was becoming much too thin. And about a year after he died, his brother died. And earlier this year, in July, my other uncle–the one who was helping me make sense of the nebulous territory of genealogy–passed away. That thread is snapping. Three aunts remain, and I can feel the precarious situation for those memories, teetering between recognition and oblivion. This found its way somehow into my novel, THROUGH THE WALLED CITY. As I labored through the research, I realized that some of what I was finding–Colombia’s history, old photographs from the late 1800’s to the mid-1900’s–correlated to what my late uncle had been able to tell me about our family’s history. With his help, I had mapped out my family tree on my father’s side to circa 1850’s, when the last known entry is of a woman with a son “out-of-wedlock.” That’s where the trail ends, and if I could go back and ask my father, I’d want to know if that was the “whore” he was referring to. But it was fascinating, pitching the research against Mica’s story. Seeing the past and the present dance, come to life. Someday, I want to breathe life into that family history. Not only for my son’s sake, so he knows his heritage, but for me, because I didn’t pay attention when I had the chance. 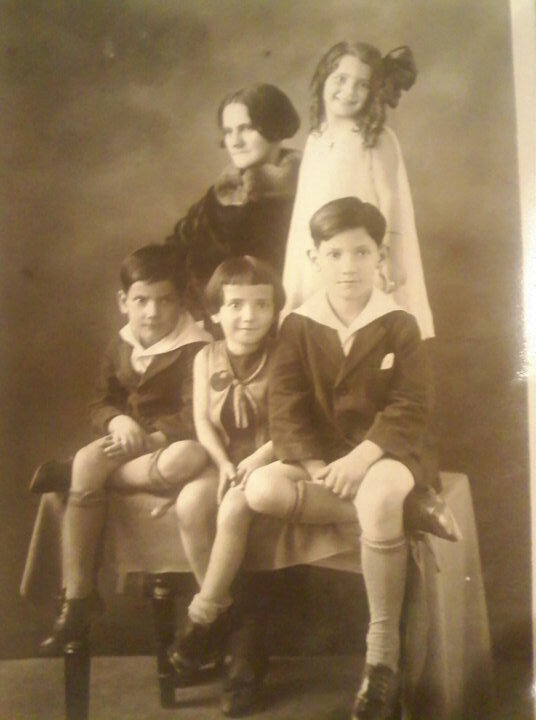 This picture is of my paternal grandmother with four of her six children. My father sits in the bottom, nestled between his older brothers. The three are now gone. I have it tucked in the corner of my dry-erase board (which hangs over my writing desk at home) as a reminder that he’s watching over me. I can’t ask him now all the questions that flood my consciousness, but writing THROUGH THE WALLED CITY gave me a better idea of the Colombia he grew up in, of the stories he heard and the climate of his land. He loved his country, which is why when he died, we took his ashes to Manizales, his hometown, to be buried with his parents. He would’ve wanted that. THROUGH THE WALLED CITY has been a special story for me for many reasons. This is one of them.